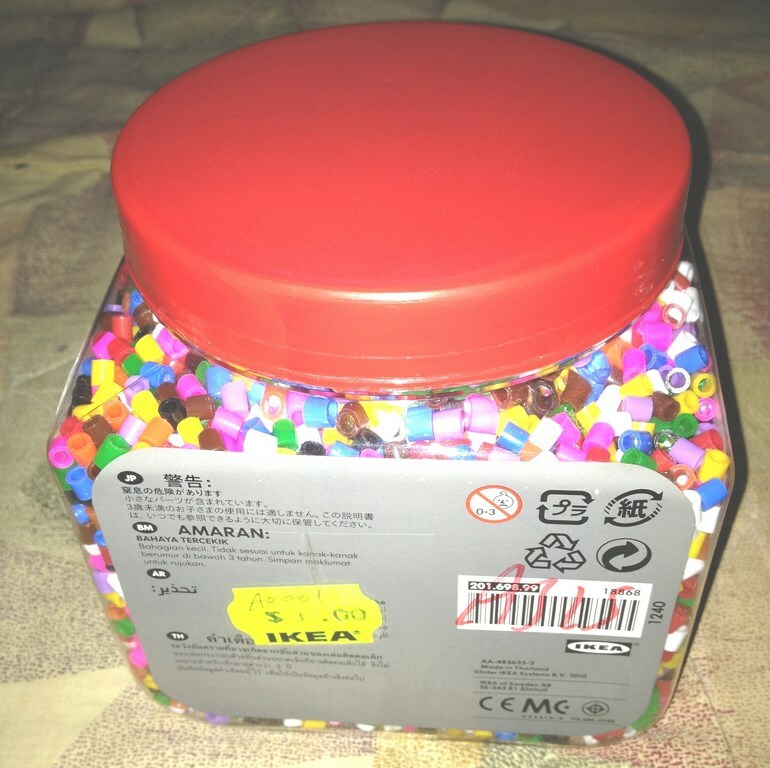 Was shopping with my sister at Ikea when I stumble upon this- Pyssla bead. Been wanting to try playing with this since it was out long time ago. 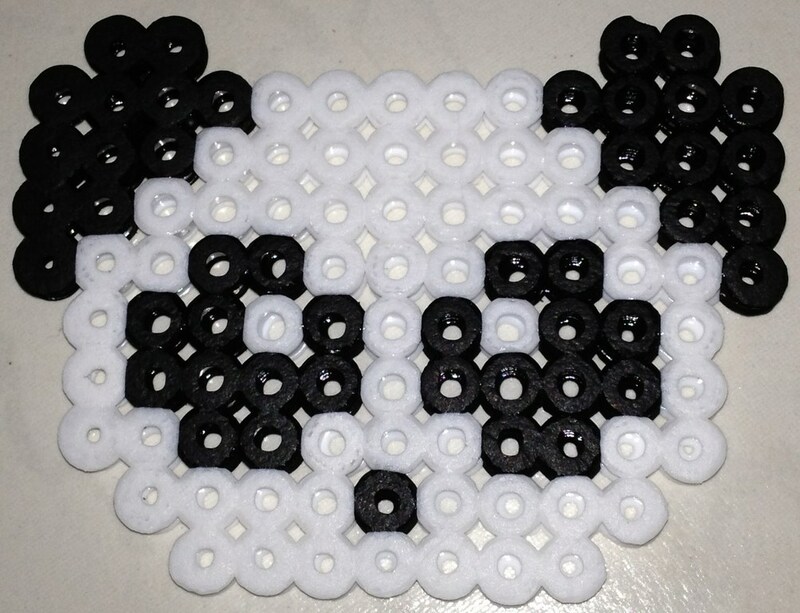 But don’t find myself creative enough to be able to come out with nice designs with the beads. The retail price for each tub is S$9.90. But I bought mine at the AS IS corner of Ikea for only S$6. Don’t find any distinctive difference between the tubs sold at the two different are, except maybe the tubs seems to be slightly dent at some corners. The boards were also bought at the AS IS corner at a discounted price of S$1. The original selling price of the pack is S$3. 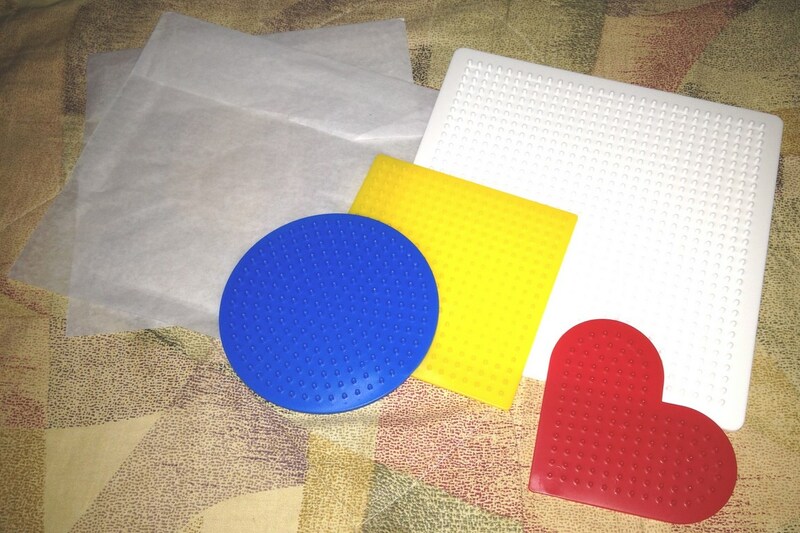 Each pack consist of 4 different shape boards and also 2 square pieces of ironing paper. 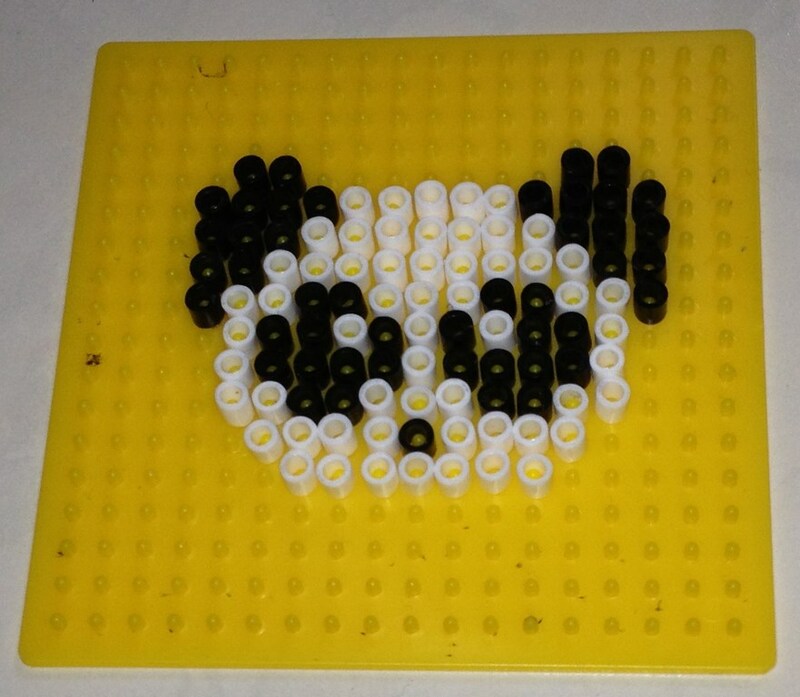 First, I need to arrange the color beads on the board to form a design I like. Since this is my first trial piece, I choose a simple black and white design to begin with. 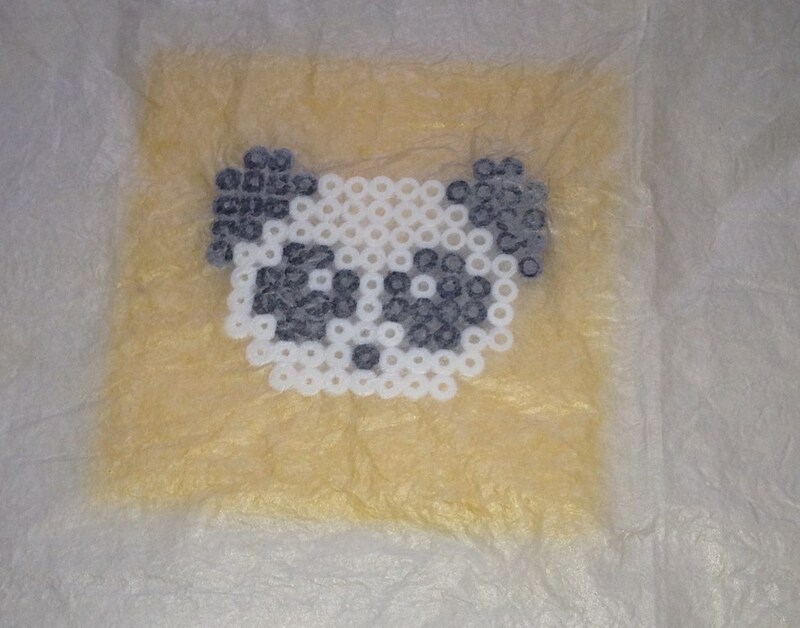 The beads were kinda small but not so small that I cannot hold it with my mere fingers. Despite so, I still have a bit of difficulty placing them on the board. By doing so, it also kinda make me more focus and calm. Once I’m happy with my masterpiece, I just had to lay a piece of ironing paper on top of the beads and I’m ready to iron it. The temperature of the iron must be set at the lowest. 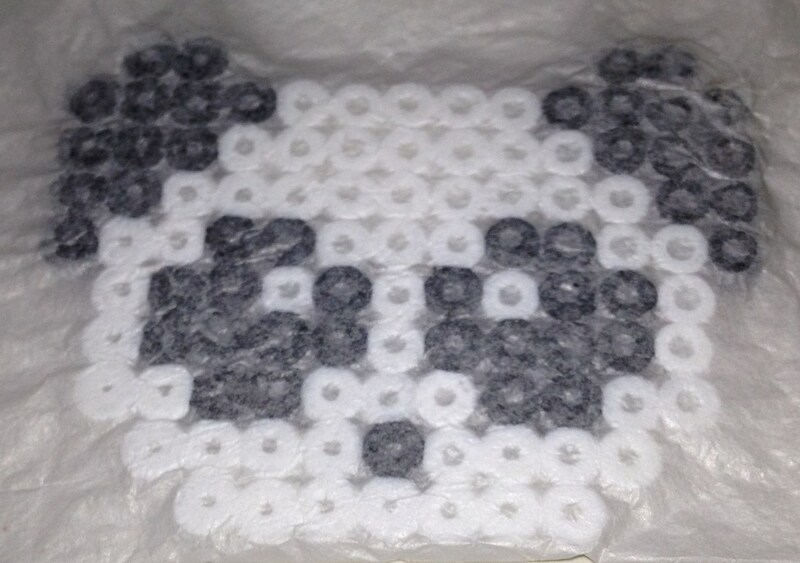 If not the beads will be fully melt and the design will not be so nice. The aim is just to make it melt slightly and enabling them to stick together to form one single piece of artwork. This is how the beads looks like after ironing on low temp for about 2 to 3 minutes. You can see that the beads had melt slightly but not totally. There is still some visible holes in each beads. But at this time of point, the beads are already sticking together. Let it cool down for a few minutes before removing it from the board. Not forgetting to lay something of a certain weight on top of your masterpiece while waiting for it to cool down. This is because the beads tend to curve slightly when cool. The weight will keep it slightly flat. And here comes my masterpiece. Am so happy with my finished work. Planning to make more to give to friends and relatives. Or perhaps make some to use as coaster to use at home now. 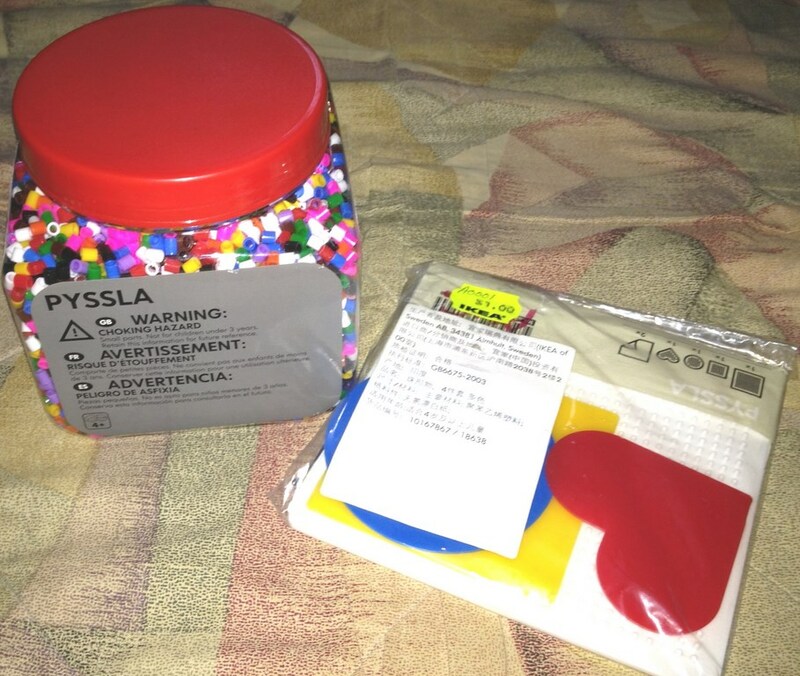 There is a limit of design I can make as Pyssla only comes in 10 colors as compare to other similar beads like Hama beads and also Perler beads. But its enough to keep me entertain as of now. Need more cute designs. Google, here I come! Got to know about this contest through a facebook pal, Joy Sung who was one of the lucky winner for Week One for the same contest. I joined through the link put up by her. Am so happy to have won. 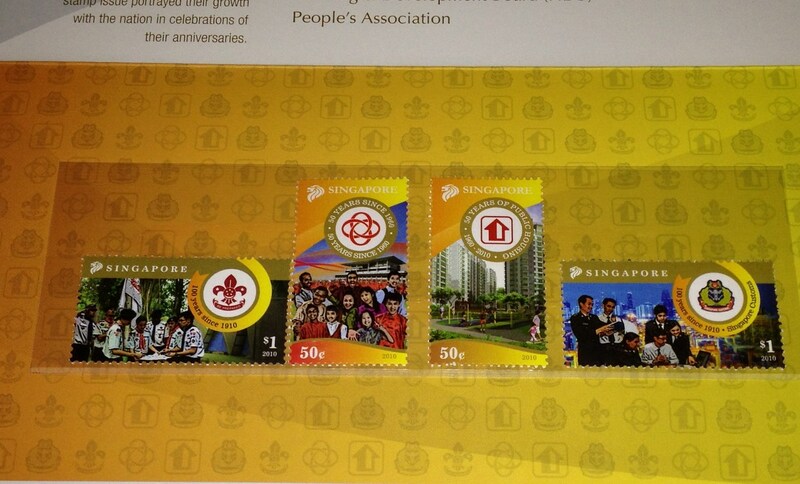 The prizes consist of 2pcs of $10 Takashimaya voucher and also a set of specially designed postage stamps. Was about to give up when I read through the terms and conditions and find out that its a “LIKES” gathering contest. I never had the confident of gathering so many likes to stay in top 3. 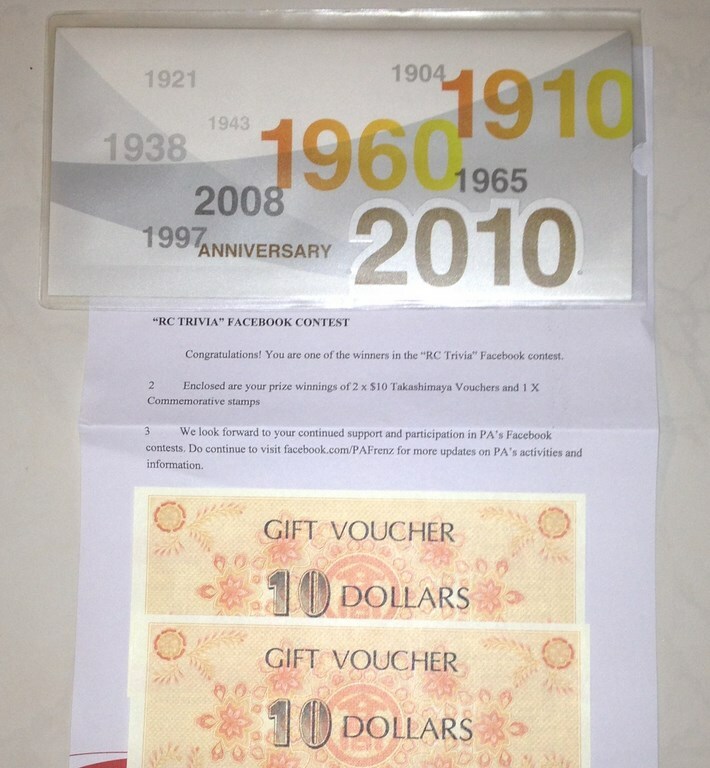 But thanks to all my facebook friends, I’m able to won such wonderful prizes. Will be treating dad to some foodies from Takashimaya on our next trip there. Speaking of, we are still thinking of what movie to watch next week. Any suggestions???? I thought I had dried out my tears the day you left me to be with the Lord. 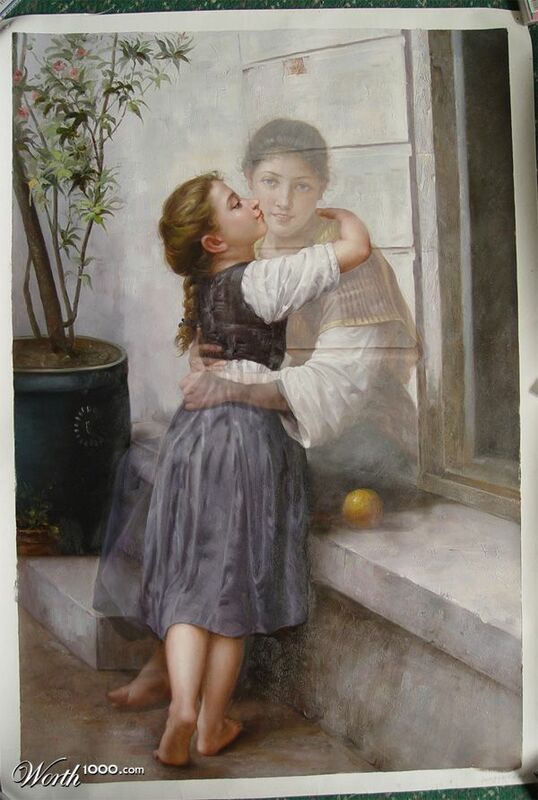 I thought that I had already learn to cope with your absence. I thought that I had become stronger by the days. But why when I spoke about you with my colleague today, tears still flow out on their own? What is this deep pain and sadness that seems to be drowning me???? Goodies From A Lovely Sister! 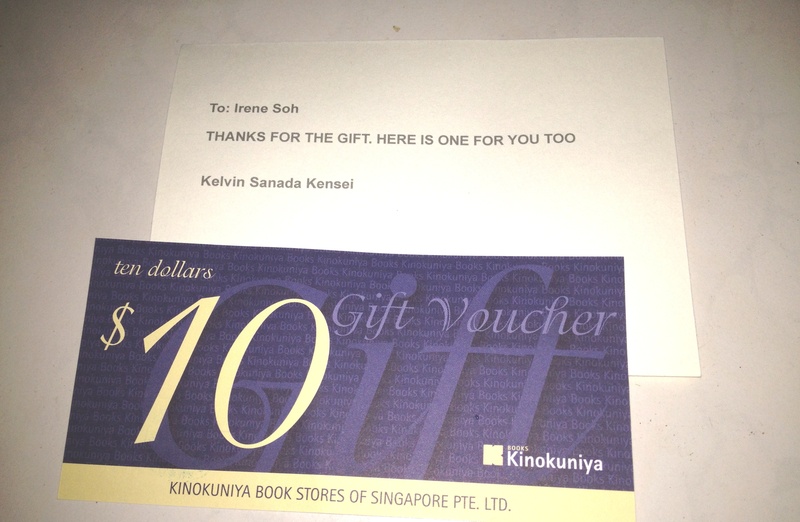 A million thanks to yet another lovely sister who came all the way down to my workplace and passed me some goodies. I felt so pampered. I used to be quite upset in not being able to win those things that I wanted in contests. But I really felt very thankful now. Instead of granting me with such mere luck, God bestowed upon me something even better- the friendship of all those lovely sisters whom I had the privilege and and honour to acquaint , both at work and on facebook. Let’s take a look what the awesome goodies that are given to me. OMG! What a spread! 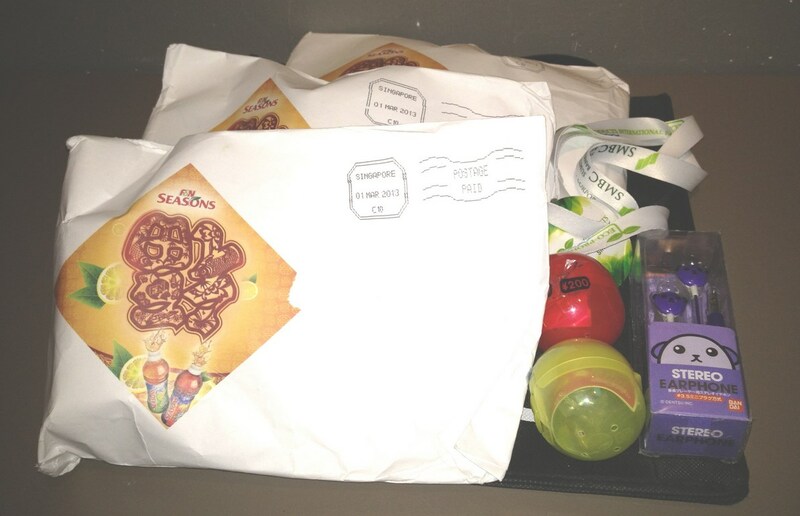 I was only expecting the three sets of goodies that Sister Sheryl had mentioned that she will be giving me. I wasn’t expecting to see so many items. I felt so loved! Aren’t you jealous of me??? Bwahahaz! 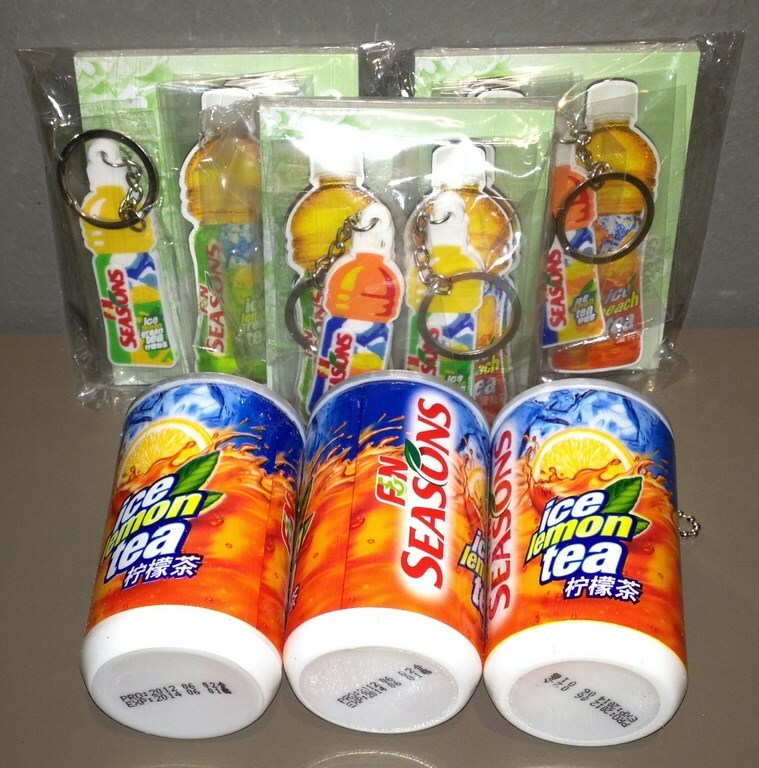 These are the goodies from the F&N Seasons coin token game that Sister Sheryl had kindly offered me. Many of my other friends found this to be the most easy to win prize from that game, with it being the lowest tier prize. But mu luck is simply… … so good that I won less than 10 sets as compare to majority of those I know. But nevertheless, too many also can be a problem. 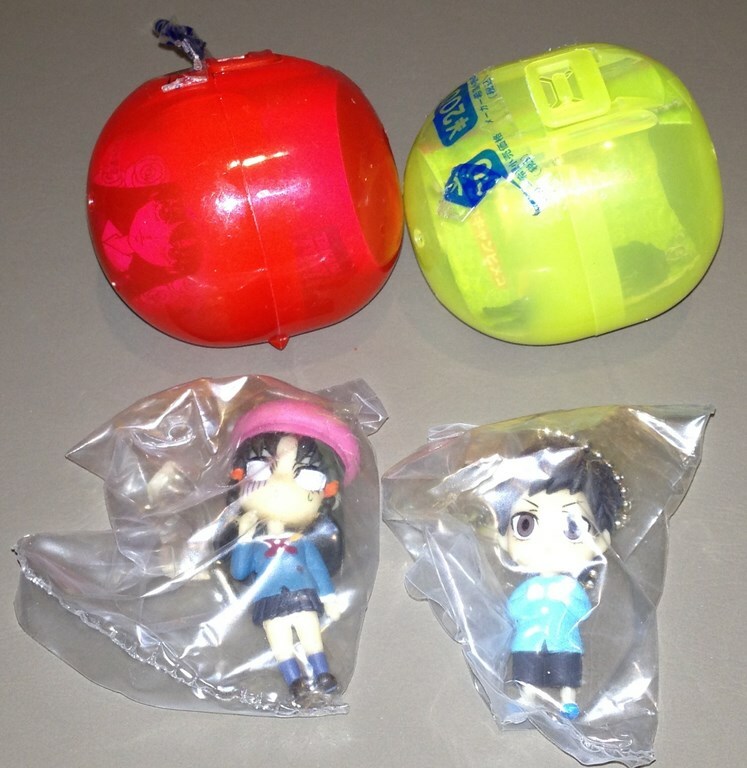 Next, Sister Sheryl also gave me two gashapon balls from her bags of gashapon capsules. WOW! They are so cute! These were not available when I finally got time to went down to the same fair too. My loots consists mostly of one piece and rilakkuma items. Which is also equally good if you ask me. 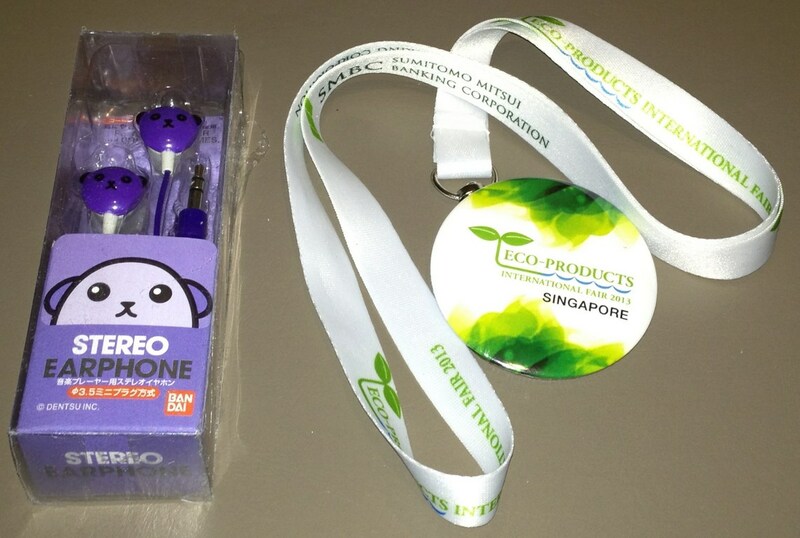 And finally a cute pair of bear earpiece, a eco badge and lanyard. So cute! Floating on cloudnine, loaded with lots of love and overwhelming sweetness from the kind thoughts of Sister Sheryl. I guess it will take me a while before I ‘return’ back to earth. Til then, au revoir. Was very happy when Song Brothers announced me to be one of the lucky winners to their Magic mobile screen cleaner. Doesn’t the screen cleaners look so cute to you. 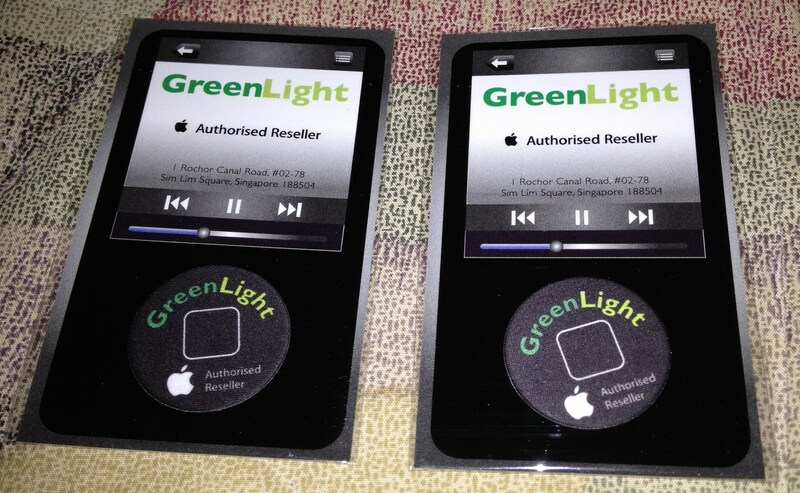 After providing them with my mailing details, I waited with much anticipation as to which design of the screen cleaner that I would received. Damn! I seriously cannot believe my eyes. If you had the cheek to write on your facebook wall that you are going to give away that amount of screen cleaners, you jolly well sort up that amount. What kind of an stupid excuse is that? And you had the face to write : ” Please continue to support us on FB”. I don’t know whether to label you as thick skin or super can’t be bothered. Channel News Asia conducted a short viewer’s survey quite some time ago and promised a cute specially designed thumbdrive for each respondent. I jumped straight to the page without reading the terms and conditions properly. It was meant to be for viewers living in Malaysia, Indonesia and India. 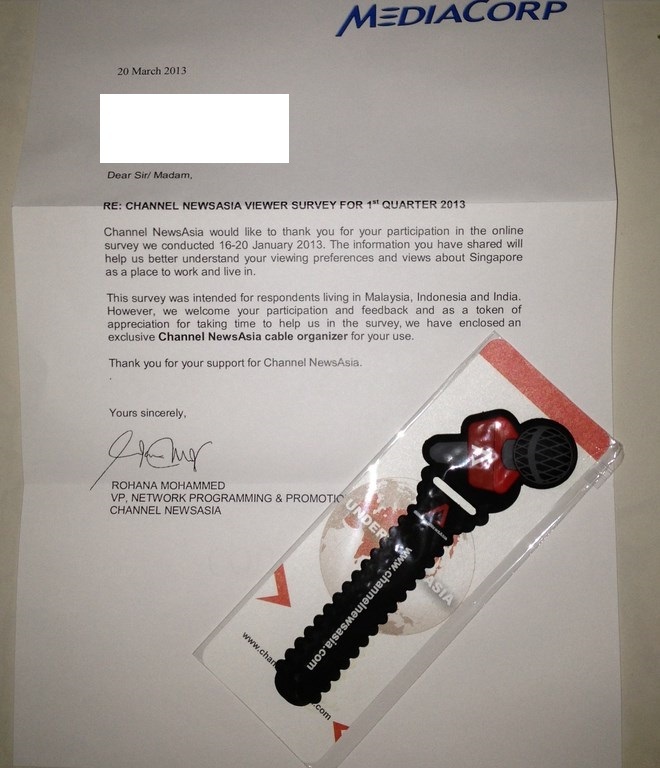 Channel News Asia was very sweet and sent me a cute cable organiser despite the fact that I did not proved to be of any help in their survey. How can one not love them for it!